Ken Gonzales-Day's photographs subtly refer to history embedded in the local landscape. 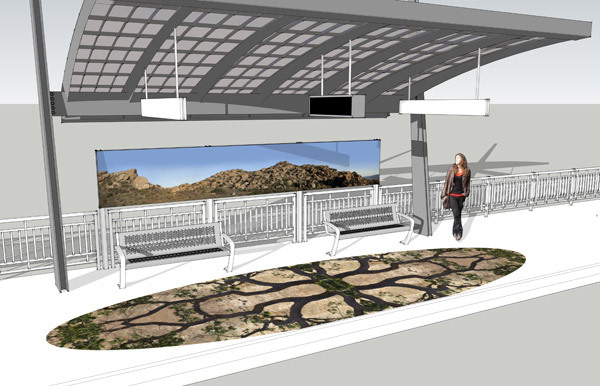 Large, enamel steel art panels alongside platform seating areas depict views of surrounding mountains that overlook the valley. The wide, panoramic views are reminiscent of Westerns filmed in the hills from 1912-1960. Because the scenes are composite views, they act as ideal, imagined landscapes tinged with cowboy nostalgia. Stone and glass mosaic paving patterns depict kaleidoscopic views of native manzanita and oak trees, inviting passengers to find shapes and faces hidden within the natural patterns. "Inspired by the community's interest in drawing attention to the natural environment and combined with my own longstanding interest in both California history and native species, I decided to bring the natural environment into the station environment. I wanted to create artworks that would function on a number of levels and could respond to the specific needs of the site: one, to soften the stucco corridors and vast parking lots that surround it; two, to enhance the station itself; and three, I wanted to create something that would be a source of pride for local residents and of interest to those passing through."